Apple's long-awaited AirPods are now available to order online in both the US ($159) and UK (£159) as well as 98 other contries including Australia, Canada, China, Hong Kong, France, Germany, India, Mexico, Netherlands, Japan and the UAE. As we write, the Apple Online Store has a cited delivery date of 22 December in the US and 19 December in the UK. 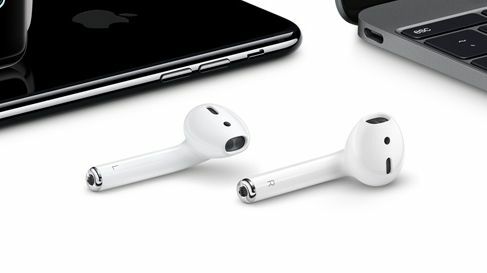 In case you missed them at the iPhone 7 launch, Apple's AirPods are completely wireless headphones that aren't even wired to each other. They use Apple's brand new W1 Chip to do all the smart stuff, working with Bluetooth for quicker and more seamless connections - we've already checked out Beats' Solo 3 Wireless headphones that also have the W1 chip in, too. Sensors detect when the AirPods are in your ear and will automatically play and pause your music. Double tapping on the AirPods activates Siri, while the AirPods are immediately set up with all the devices signed into your iCloud account. AirPods support 5 hours of playback, but the genius is that the compact wireless charging case includes a portable battery so you can actually use them for up to 24 hours on and off.